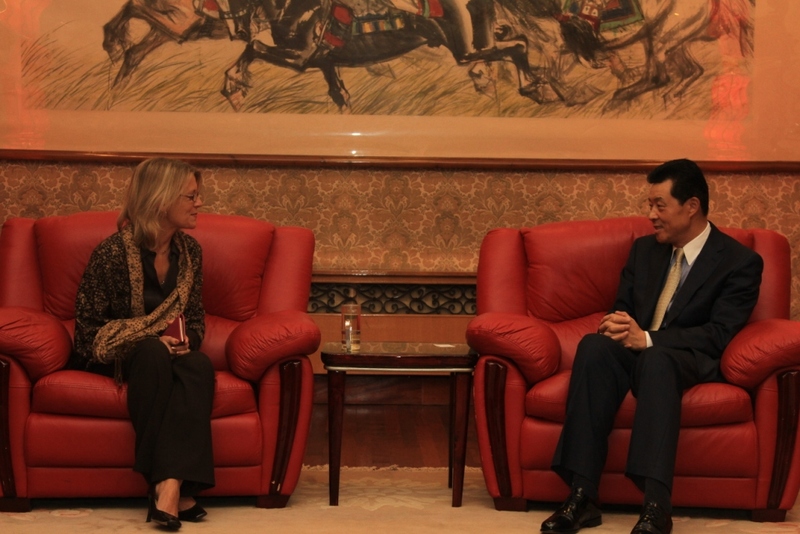 On November 9, Ambassador Liu Xiaoming met at the Embassy with Ms. Jasmine Whitbread, Chief Executive of Save the Children International and Ms. Pia MacRae, the new chief country representative of Save the Children China Programme. Ambassador Liu spoke highly of the efforts made by Save the Children in the protection of children in China and in the world, particularly the cooperation of the organization in improving the life and education of the children in the poverty stricken areas in China. He said that China has more than 300 million children, most living in rural areas. The Chinese Government attaches great importance to the protection and development of children's rights. It has built a sound legal system for protecting the rights of children with constant efforts. The environment and conditions of the subsistence, protection and development of children have been significantly improved and great achievements have been made in children’s development. Ambassador Liu said that due to the constraint of economic conditions, children’s protection in China is still facing some problems and difficulties. The environment and conditions for the subsistence, development and protection of children vary in different regions and between urban and rural areas; the environment for children's development needs to be further improved; and the health, education and protection of rights of the children in floating population need to be further addressed. These issues will be resolved with China's economic development and social progress. The Chinese government welcomes the pragmatic cooperation of overseas non-governmental organizations in poverty alleviation, education, health care and philanthropy. Ambassador Liu hoped that Save the Children International would help promote children’s protection in China and other countries and make further contributions to the children’s protection worldwide. Ms. Jasmine Whitbread briefed Ambassador Liu on Save the Children International and its China Programme. She spoke highly of China's achievements in children’s protection and said that Save the Children is ready to closely cooperate with the Chinese government departments at all levels to further its work in the health, education and welfare of children in China and actively take part in China’s cause of children’s protection. Save the Children International was founded in May 1919 as a non-profit, non-political and non-religious international philanthropy institution for children. Currently the organization is working for the health, education and welfare of children in over 20 provinces, municipalities and autonomous regions in China, including Yunnan Province, Anhui Province and Tibet Autonomous Region. Its focus is in the field of vulnerable children. In February 2011, the Poverty Alleviation Office, Ministry of Foreign Affairs and Save the Children China Programme signed a memorandum of understanding on poverty alleviation cooperation. The two sides agreed to implement teachers training projects and other projects in Jinping County and Malipo County of Yunnan Province, the designated poor counties receiving the aid of the Ministry of Foreign Affairs, in the next five years.